A 40-unit complex in Eugene. It is comprised of studio, one- and two-bedroom units that are reserved for households earning 50% or less of area median income. A 51-unit apartment complex in Portland. It is a senior community for individuals who are 55 and older. However, eight units are reserved for homeless veterans. Forty apartments are available to households with low- and moderate-income. Network for Oregon Affordable Housing (NOAH) is a Portland, Ore.-based nonprofit that promotes statewide affordable housing development through pre-development loans, long-term financing, access to tax-exempt bond financing and technical assistance. Through the leadership of the Oregon Bankers Association, NOAH was established in 1990 as a statewide nonprofit corporation to increase the supply of affordable housing. NOAH is a federally certified Community Development Financial Institution (CDFI) with a 26-year history of delivering financial and programmatic solutions that enhance livability. NOAH has funded over $290 million in loans for over 200 properties and more than 9,500 units, leveraging more than $1.1 billion in total project capital. With total assets exceeding $120 million, NOAH supports the acquisition, renovation and construction of affordable housing properties throughout the state. Approximately 46% of its lending is in rural areas. A 30-unit complex in Portland. The development includes 10 studio apartments, 17 one-bedroom apartments, and 3 two-bedroom apartments. The units are available for households earning 50% or less of area median income. A 34-unit multifamily community in White City. The complex has eighteen units designated for veterans. Rent is affordable for families with low- and moderate-income. A 16-unit multifamily development in White City. The units are affordable for households earning 50% to 60% of area median income. A 26-unit area in La Pine. The building offers 22 one-bedroom apartments and 4 two-bedroom apartments. The units are affordable for households with low- and moderate-income. Additional services include a community garden, chicken coop, and a courtyard. A 40-unit project in Woodburn. The development houses farm-workers and their families. It is affordable for households earning 50% or less of area median income. A 26-unit community in Gresham. It is reserved for families with low- and moderate-income. 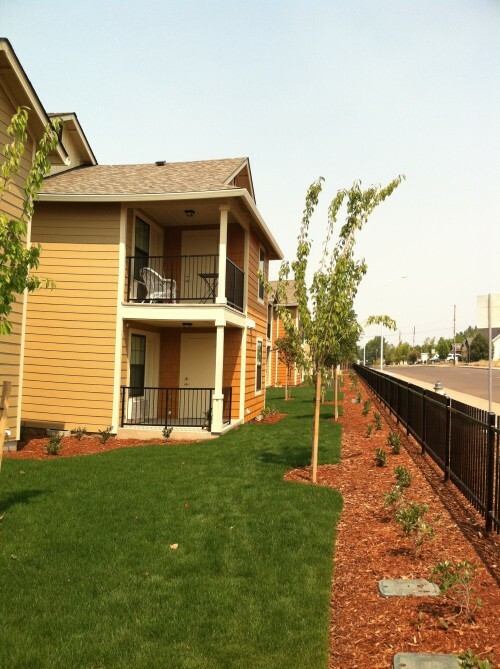 A 54-unit complex in Eugene. The units are either flats or townhouses that support seniors, disabled residents, families and veterans. The one-, two-, and three-bedroom units are accessible to households that earn 50% of area median income. A 33-unit manufactured home community in Leaburg. A majority of the units are available to residents that earn 80% of area median income. Amenities include a bath house, garage, and a recreation room. A 58-unit project in Wilsonville. The development is designated for low income seniors who earn 46% to 57% of area median income. A 50-unit building in Portland. The development includes 42 one-bedroom units and 8 two-bedroom units. The apartments are available for residents that earn 30% to 59% of area median income.